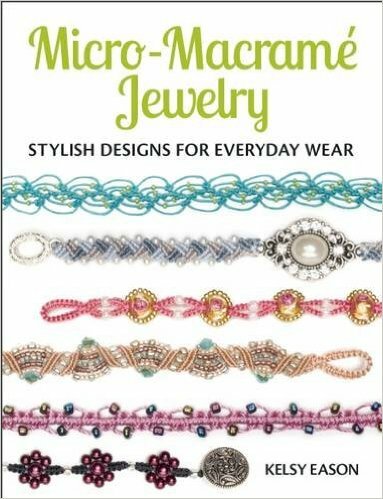 The designs you will find in Kelsy Eason's new book, Micro-Macrame Jewelry, published by Kalmbach, are lighter, more open lacy and airy designs overall than you usually find in micro-macrame books. 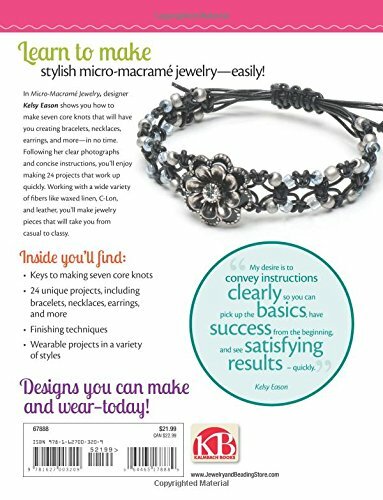 Kelsy has decided that she wants her designs to be appropriate for everyday wearing, not just special occasions, so she has concentrated on easy-to-find materials and easy-to-learn knots. Most of the designs use the slightly larger size 6/0 seed beads, C-Lon or S-Lon cords, waxed linen, or 1mm round leather cording. All of these are readily available online and in beading or craft stores. There is only one piece of specialty equipment needed, and that is a padded bead board. If you don't want to invest in one, Kelsy shows you to make one! The knots used are ones you probably are already familiar with if you've done any macrame in the past, and they are all easily learned if you are a beginner: Lark's head (both horizontal and vertical), square knot, half knot, and half hitch (both diagonal and horizontal). 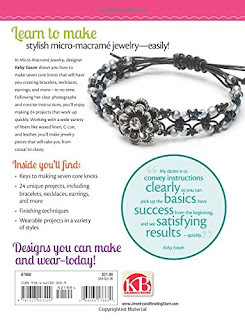 The designs you can make with these few knots are young and fresh and fun...give it a whirl!